Resources allow you to provide announcements, documents, audio or video links, and other resources for your people. These are made available on a Resources tab on a person’s record and so can be accessed by anyone with at least a MyData account. Configuring Resources on your database requires one administrative setting and at least one custom Role. Once this basic configuration is in place, three new options appear in the Administration menu, allowing you to manage Resources. To enable Resources on your database, add the administrative setting Resources-Enabled and set its value to true . In order to see the new Resources menu options and to manage Resources, the custom Role ManageResources is required. Add the new Role at Administration > Setup: Lookup Codes, selecting Roles from the Miscellaneous panel. Then assign the new Role to anyone who needs to manage Resources. An optional custom Role, ViewResources, allows one to see the resources on another person’s profile. This is useful for testing and troubleshooting, allowing you to verify that resources have been made available to a particular person. Add this custom Role and assign it to anyone who needs to test and troubleshoot Resources. When the administrative setting and custom Roles are in place, three new options in the Administration menu are available to those with the ManageResources role. The first of these, Resource Types, allows you to configure the basic types of resources you will provide. This will be the highest level in the Resources organizational structure and will define what sub-tabs appear under the Resources tab. It is your decision what types to include. Examples are Participant Guides, Leader Guides, Sermons, and Devotionals. But you have complete control to enter the Resource Types that are appropriate for your church and its ministries. While changes certainly can be made later, it will be worthwhile for you to think through what resources you plan to provide and how they will be organized. 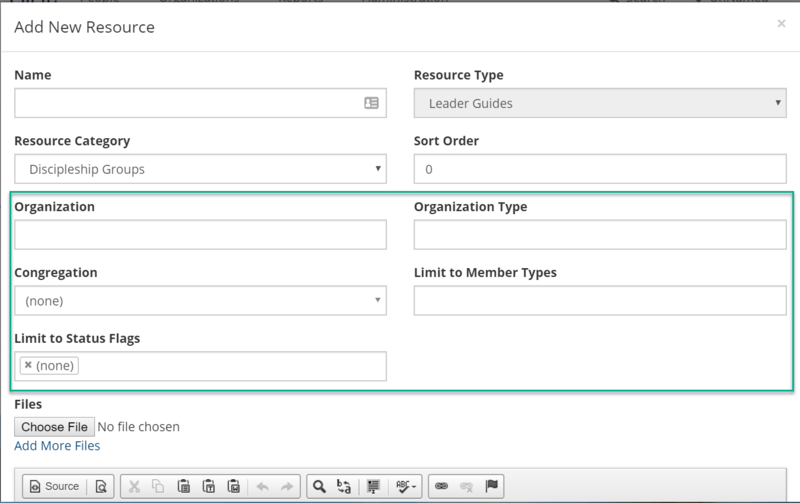 Resource Types are the highest level in the resource organization structure and translate to sub-tabs under the Resource tab. Resource categories are the next organizational level and translate to sections within a Resource Type’s tab. To add a type, select Resource Types from the Administration menu. Then click Add Resource Type , enter the desired name, and click the blue check mark to save the name. Finally, enter a number in the Display Order. On a person’s record, Resource Types will appear as tabs within the Resource tab. The display order determines the order in which these tabs display – from left to right in the order of the numbers. On a person’s Resources tab, Resource Categories group resources into sections within a Resource Type’s tab. For example, if you have a Resource Type for Bible Study, you might have categories for Bible Reading Plans, Daily Devotional, and Bible Study Resources. To add a category, select Resource Categories from the Administration menu. Then click Add Resource Category , and enter the desired name, Resource Type, and Display Order, clicking the blue check mark to save each. The resource type is the type to which the new category should be associated. (If the same category name will be associated with multiple resource types, you will need to add it once per type.) The display order determines the order in which these tabs display – from top to bottom in the order of the numbers. With all the configuration and organizational structure in place, you can now add the actual resources. Specify where the resource belongs. Determine in what Type and Category the new resource will be made available. You must select the Type before clicking on Add Resource . After selecting the tab for the desired Type, click on Add Resource . Enter a name for the resource and select the desired category from the Resource Category drop down list. This list will contain all the defined categories for the resource type you selected earlier. Set the Sort Order. Enter a number in the Sort Order field to determine where this resource will appear within the defined category. Smaller-numbered resources will appear at the top of the category section; larger-numbered resources will appear lower. Determine who will have access to the resource. There are a number of options for determining who will have access to the resource. Organization Select one or more organizations to limit the resource to members of the selected orgs. You can select the desired organization(s) from the drop down list or begin typing the name of the org to quickly locate it. Organization Type If you have defined organization types on your database, you can specify one or more organization types. The resource will be limited to the members of organizations that are of the selected organization types. Select the desired types from the drop down list. Congregation If you have defined campuses on your database, you can specify one or more. The resource will be limited to people in that campus (congregation). Select the desired campus from the drop down list. 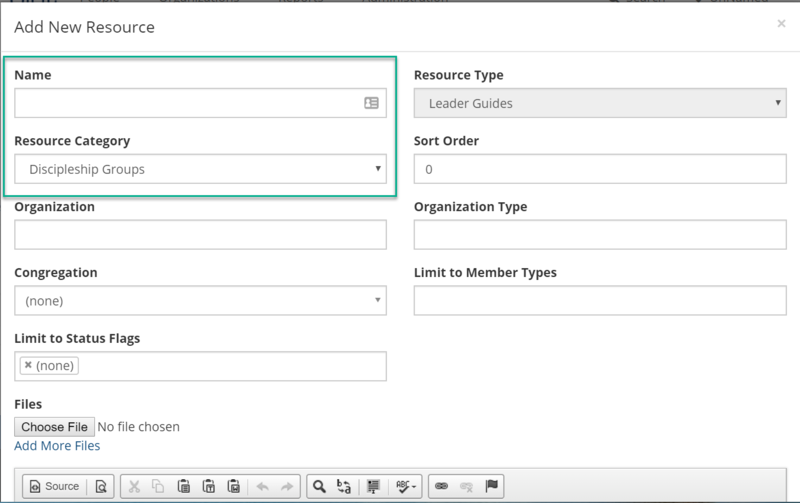 Member Types Specify one or more member types to limit the resource to those who have the specified type(s). If you have also specified organizations, someone must have the specified member type in those organizations in order to access the resource. Status Flags If the options above are not sufficient to define who should have access to the resource, you can select one or more status flags. The resource will be limited to those who have the specified status flag(s). This will be further limited by settings in any of the other options. Currently there is misleading behavior when creating a resource. By default, the Limit to Status Flags field contains an entry labeled (none) . This entry must be removed if you do not intend to limit the resource by a status flag. This requirement will be eliminated soon, but for now you will need to manually remove the (none) status flag entry. These access settings are cumulative. In order to have access to the resource, someone must meet all the criteria that have been entered. If all these fields are left empty, the resource will be available to everyone. Edit the resource content. The content of the resource can be made available by a variety of means. Files (such as .pdf documents) can be attached to the resource. 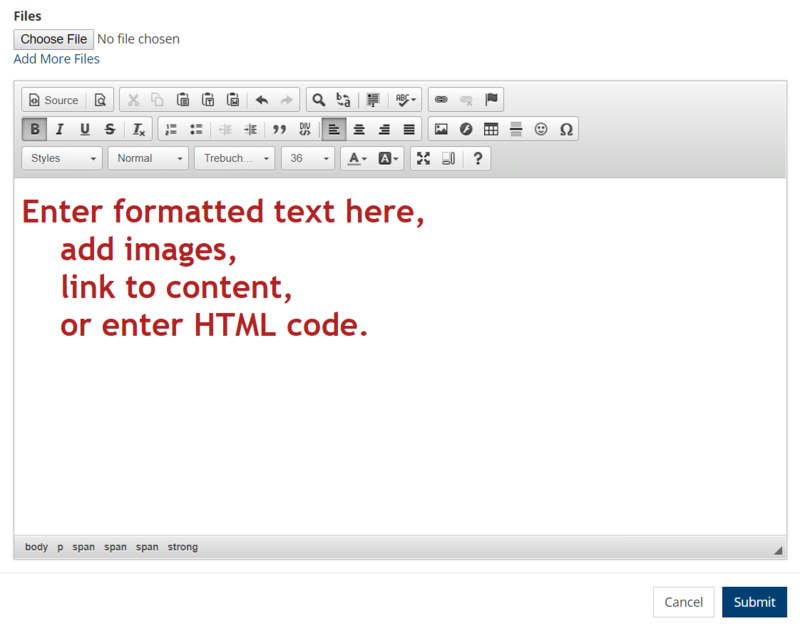 The provided text editor can be used to enter formatted text, add images, link to web resources, or even to enter HTML code. After you have entered all the content for this resource, click on the Submit button at the bottom of the Add New Resource window. When resources are available for a user, they can be found on the Resources tab of that person’s profile. Within the Resources tab, there will be an embedded tab for each Resource Type for which that person has resources. Each Type tab will have sections for each Resource Category for which that person has resources. Expand the category label to see the available resources within it. It’s easy to make Resources available for app users. 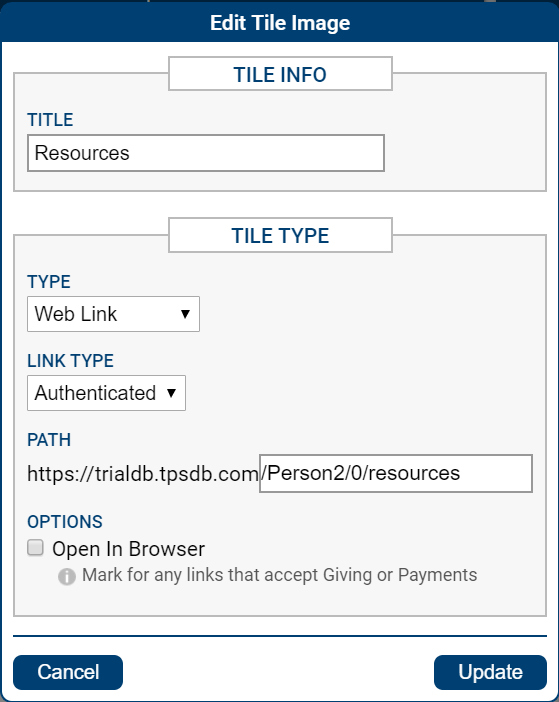 Configure a tile as an Authenticated Web Link. Give the tile a Title of “Resources” or some other meaningful name. Set the Type to Web Link. Set the Link Type to Authenticated. Enter /Person2/0/resources in the Path. That’s it. When app users click on the tile, they will be prompted to enter their password again (for security purposes) and will be taken to their resources page. Deleting resources, types and categories is a simple process. In the main page for Resources, where all the resources are listed, the right-most column (labeled Action) provides a Delete button. Clicking on this button and responding to the “Are you sure?” prompt is all that is necessary to remove a resource. Types and Categories also have the Delete button, but you must first remove all items contained within one of them before deleting it. That is, you cannot delete a category if it has resources within it. Similarly, you cannot delete a type if there are categories assigned to it.